Andrew Jackson was the 7th President of the United States. What is Andrew Jackson most known for? Andrew Jackson is most famous for being considered the first "common man" to become president. He also made changes to the way the presidency was run. Prior to becoming president he was known as a war hero from the War of 1812. Andrew's life started out difficult. His parents were poor immigrants from Ireland and his father died just a few weeks before Andrew was born. Despite not having much of a formal education, Andrew was smart and learned to read at a young age. When Andrew turned ten, the Revolutionary War had begun. His two older brothers both joined the army and Andrew became a messenger for the local militia when he turned 13. Both of his older brothers died in the war. Andrew survived, but had some harrowing experiences including being captured by British soldiers and receiving a scar across his face from the sword of a British officer. After the Revolutionary War, Jackson became a lawyer and moved to Tennessee to practice law. He started up a cotton plantation called the Hermitage which would eventually grow to over 1000 acres. In 1796 Jackson became Tennessee's first member of the U.S. House of Representatives. He would also serve as Senator for Tennessee. It was during the War of 1812 that Jackson gained national fame which would later help him to become president. Jackson was appointed leader and General of the Tennessee militia. He led them to several victories. When the British were expected to attack New Orleans, Jackson was put in charge. At the Battle of New Orleans Jackson claimed the one major victory over the British in the war. With 5,000 men he soundly defeated 7,500 British soldiers. The British had over 2,000 casualties while Jackson's army only suffered around 70. During the Battle of New Orleans, the U.S. soldiers said Jackson was as tough as "old hickory". This became his nickname. Jackson first ran for president in 1824. He lost the election to John Quincy Adams despite receiving more votes in the election. This was because no candidate received a majority of votes, leaving Congress to decide who would be president. They chose Adams. In 1828 Jackson ran again. This time he won the election, despite his opponents attacking him in many personal ways including attacks on his wife, Rachel. Rachel died a few weeks before Jackson's inauguration and he blamed her death partially on his opponent's accusations. After becoming president Jackson assumed more power than any president before him. Some people even gave him the nickname "King Andrew". Some of these changes, like hiring and firing cabinet members, are still used by presidents today. Jackson wanted a small, but strong federal government. He fought against the national bank saying that it helped the rich and hurt the poor. He also insisted that states were required to follow federal laws. Jackson died at his plantation, The Hermitage, at the age of 78. When his wife died he asked his wife's niece, Emily Donelson, to serve as First Lady and hostess at the White house. Jackson was in a number of gun duels. In one duel he was shot in the chest first, but managed to stay standing and shoot and kill his opponent. The bullet could not be safely removed and remained in his chest for the next 40 years. Jackson is the only president to have been a prisoner of war. 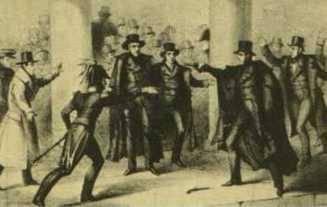 An assassin once tried to shoot Jackson with two pistols. Lucky for Jackson both pistols misfired. The assassin was captured and Jackson was fine. 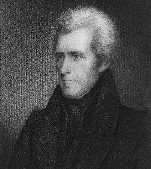 Upon leaving the presidency, Jackson said he had two regrets: that he "had been unable to shoot Henry Clay or to hang John C. Calhoun". Clay was a political rival while Calhoun was his first vice president who proved disloyal to Jackson.